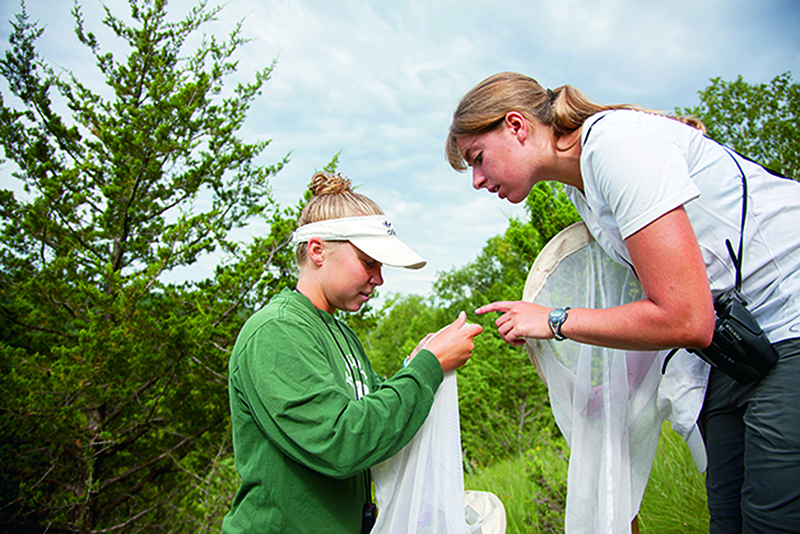 Sharon Heyer ’11 and Nicole Powers ’14 spent the summer of 2013 surveying prairie hillsides for rare butterfly species. In May 2012, Luther received a grant of $1.5 million from the Howard Hughes Medical Institute (HHMI). The HHMI awarded the grant as part of its Preparing Future K–12 Teachers Program, which, says Luther professor of biology Scott Carlson, “increases the connection between future educators and scientists, between those bound for graduate school and those bound for the classroom.” After all, he says, “Educators who encounter research as an undergraduate prove to be more effective teachers.” And better teachers, of course, groom better future scientists. The lion’s share of the four-year grant, according to Carlson, has gone toward summer research trios that take advantage of Luther’s engaged faculty and their willingness to collaborate with students. Each of the seven trios receiving funding this summer comprises one faculty advisor, one science student, and one educator (either a pre-service undergraduate education student or an educator already working as a high school or middle school teacher). Here we take a closer look at one of the trios, researching rare butterflies. What would lead a well-adjusted middle school teacher to forsake an air-conditioned classroom for steep rocky slopes, surprise rattlesnakes, and fulsome chigger welts? The tawny emperor, Juvenal’s duskywing, and the great spangled fritillary—in other words, the chance to survey hillside prairie butterflies at 13 sites in Allamakee County. Powers and Heyer both have cross-country training—in fact, they first met on Luther’s cross-country team—but Larsen promises that this didn’t have a bearing on his choosing them to work with him. “It just sort of worked out that I got really well-conditioned athletes,” he laughs. The project, with all its athleticism and daring, was spurred by the personal collection of a local butterfly enthusiast named John Nehnevaj. In the 1980s, Nehnevaj recognized that hillside prairies were endangered ecosystems that housed specialist butterflies not found in other habitats. So he set about doing an extensive butterfly survey of various sites in Allamakee County. Last fall, when Nehnevaj donated his 1980s butterfly collection to the college, Larsen noticed that it contained—in ample numbers—a species called the ottoe skipper, which is thought to be going extinct in the state of Iowa. So Larsen’s trio is revisiting the areas that Nehnevaj surveyed and collecting not only presence or absence data on this and other butterflies, but also abundance data, which means they’re counting the butterflies and bringing back select voucher samples (essentially proof that a species was actually spotted). Not only did the group encounter the ottoe skipper, but they also found the Baltimore checkerspot, the wild indigo duskywing, the hickory hairstreak, and the (not-so-common) common roadside skipper, all of which are listed as threatened or of special concern in Iowa. Biology maintained by Kirk Larsen. Page last updated on 6 November 2017.